(silent auctions) on various coin/currency/hobby items being sold by club members. If you are bringing any items to sell on the bid boards, please try to be there by 6:00 pm or earlier. This is mainly just a social get-together. Guests are always welcome. In order to get a more accurate account of how many pizzas to order, I would appreciate reply confirmations, if possible, from any of you planning to attend and how many guests you might be bringing as well. 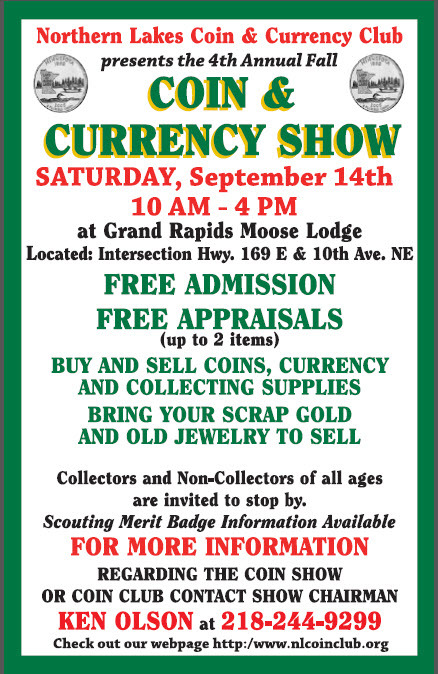 The Northern Lakes Coin and Currency Club wishes to invite club members and new guests interested in the hobby to attend the monthly meeting on Monday, October 21st, at 7:00 PM, in the Grand Rapids Township Building, 216 North Pokegama Ave. This month’s seminar will be about Silver Eagle products from the U.S. Mint. Non-members are welcome to attend. Monday May 20, 2013 @ 7:00 pm. Seminar will be Walking Liberty Half Dollars, followed by a Grading Session. This page shows trends for Walking Liberty Half Dollar melt values. A coin's numismatic value may be higher than its melt value. See pricing for U.S. Silver Coins in the NGC US Coin Price Guide. Numismatic specification data provided by Krause Publications NumisMaster. Information courtesy of NGC and Krause Publications.